This may be my last significant entry for about a week or so, as things are getting quite hectic with the move. Last Friday all of the major plumbing and electrical work came to an end at the condo. That doesn’t mean it is over, necessarily, but in theory there is enough completed that we could now live there. On Friday afternoon the floors were sealed and we let them dry over the weekend. Only to come in and find that the half-meter long scratch by the front door looks even worse now that they tried to stain it to blend it in with the rest of the floor. Additional work yesterday seems to have improved it a little, but as I told Tawn, the floor is coming “pre-distressed”. Monday, Tuesday and Wednesday there has been a parade of other workers coming in and I’ve spent several hours working on the solitary dining table with my laptop, as has Tawn, alternating shifts to babysit the details, since these workers seem especially prone to cut corners. 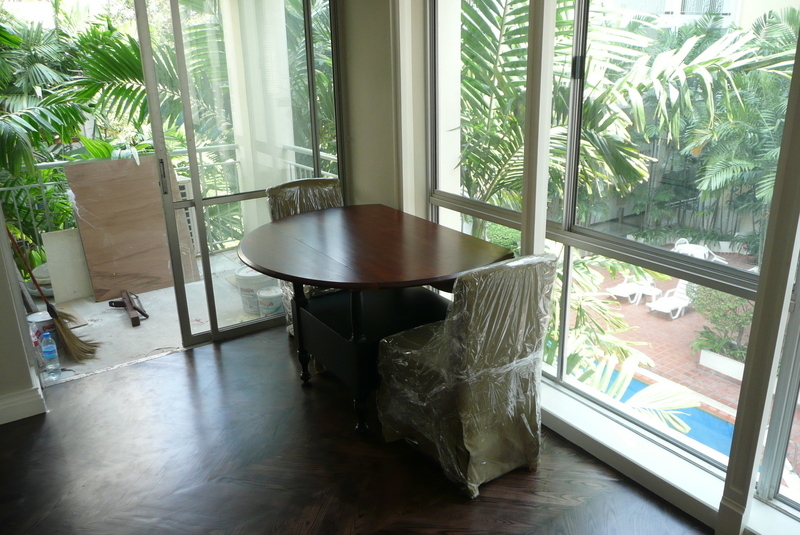 Left: One piece we didn’t have to have made was this drop-leaf dining table. It looks nearly identical to the one in the Pottery Barn catalog on which I based my drawings. 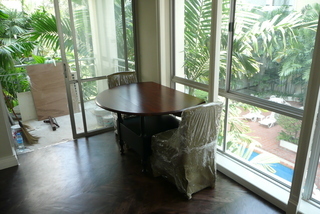 Since space will be tight in the living/dining room a drop-leaf seemed to be the best option. It can seat six easily and eight cozily. The shower glass has been installed, although there are configuration issues that will have to be worked out after we move in. The doors should be raised and another strip of stone installed to keep the water from pooling in a small channel outside the glass. 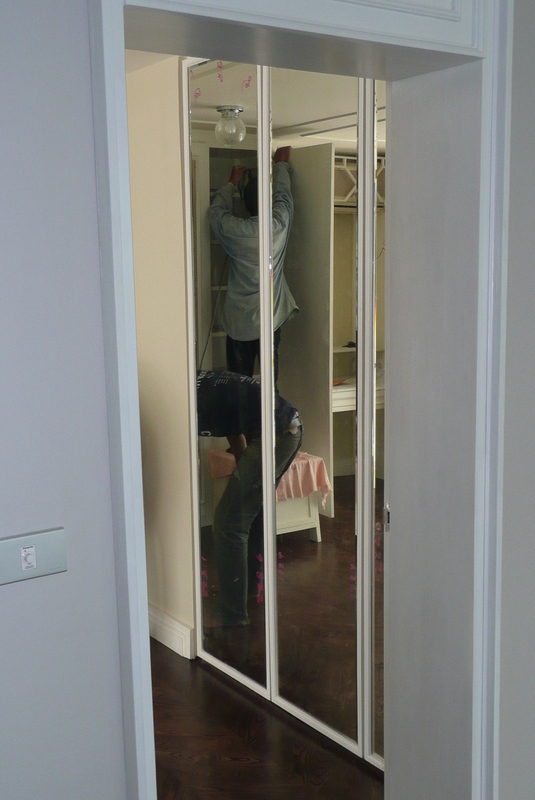 Right: Installation of the glass shower doors which are of a “floating” type. I’m a little skeptical how safe they would be in there was a slip and fall accident. The washer and dryer have been installed (left), although the space doesn’t work as was intended and the air duct runs into the empty space above the ceiling but doesn’t actually run to the external air shaft. Additionally, it sits too far forward. We’ll probably have the cabinetry to the left of the dryer modified so the air duct can run through it instead. It turns out that the cabinet quote didn’t include a 2/4 lazy susan that can open out and make good use of the otherwise hidden corner behind the oven. After some comparison shopping, I bought a model from Häffle, a German manufacturer known for their precision and quality. In order to get it that day I had to drive from their show room at Sukhumvit 64 (near the edge of the city limits) to their warehouse in Bang Na. Being a farang, Tawn insisted the have someone ride with me to show me the way. The 20-year old stock guy looked petrified but I assured him I was a good driver. When we arrived at the warehouse, the workers gave him grief for having to be driven around by a foreigner. That should give him something to talk about over dinner with his family. 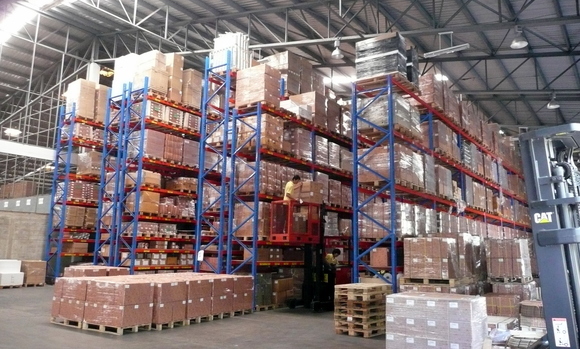 Below: The Häffle warehouse in Bang Na. 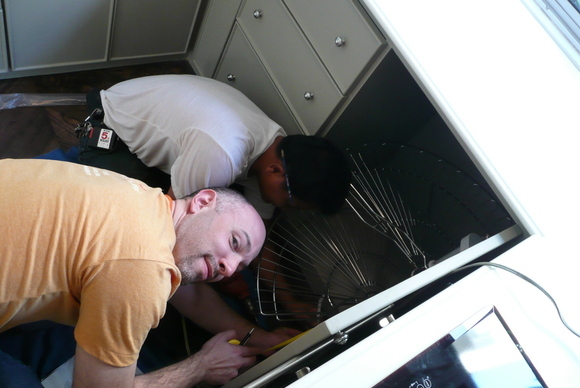 Below that: Chris helps to install the shelving which included tremendously precise measurements that didn’t take into account the fact that the cabinet did not have flush doors. The refrigerator (right) has been installed but the floor is way off level and the handyman will have to figure out a solution. Probably just a piece of wood under the left-side rollers to balance it. Some unconditional good news: the oven and stove have been installed and work beautifully. The oven really retains heat for a long time afterwards, which makes me think that it is well-insulated. The induction stove is amazing. 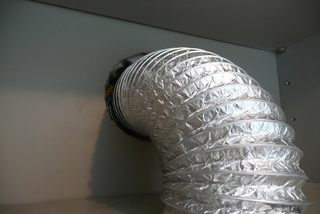 A hole in the external wall for the hood vent has been cut and the duct installed, below. It seems to work well but the hole is just plain ugly. I was trying to describe to Tawn the liquid foam insulation that can be used to plug the hole. He didn’t get what I was talking about so I’ll look on the internet for a picture. One outstanding plumbing issue is that the water filter under the kitchen sink is not installed, so the water supply to the sink has yet to be turned on. 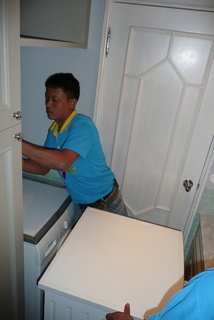 No sink in the kitchen is not good, but we can work around it for a few days. 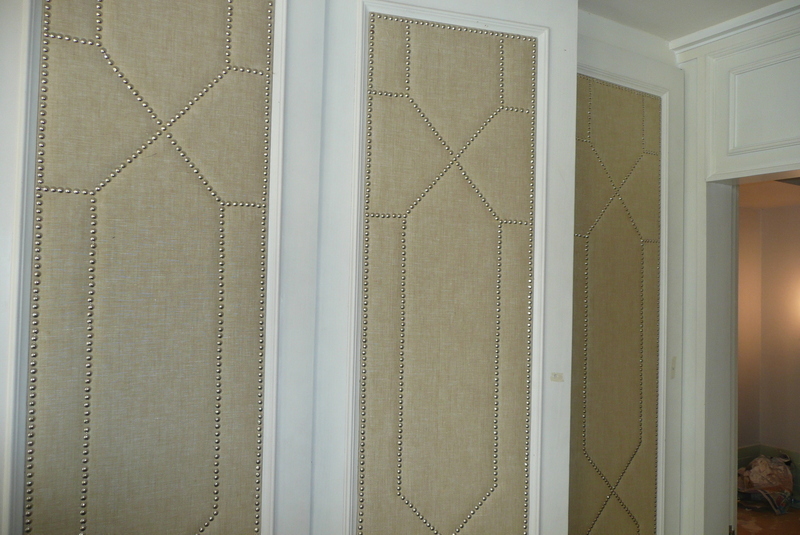 The bedroom cabinet doors were re-installed after the fabric guy created and attached fabric panels, right. These will soften the room a bit and incorporate an idea I originally suggested, while conceding to Tawn’s taste for the studded padding. There are four dozen other details that are being followed up on, none of which is serious enough to keep us from moving in and all of which will sound familiar to everyone who has ever built a house or done a remodel. Nobody else cares about the details in your own house’s construction like you do, right? Case in point – the picture to the left shows a worker using one of our side tables as a ladder. Tawn was, needless to say, not happy about their hesitancy to use and actual ladder. 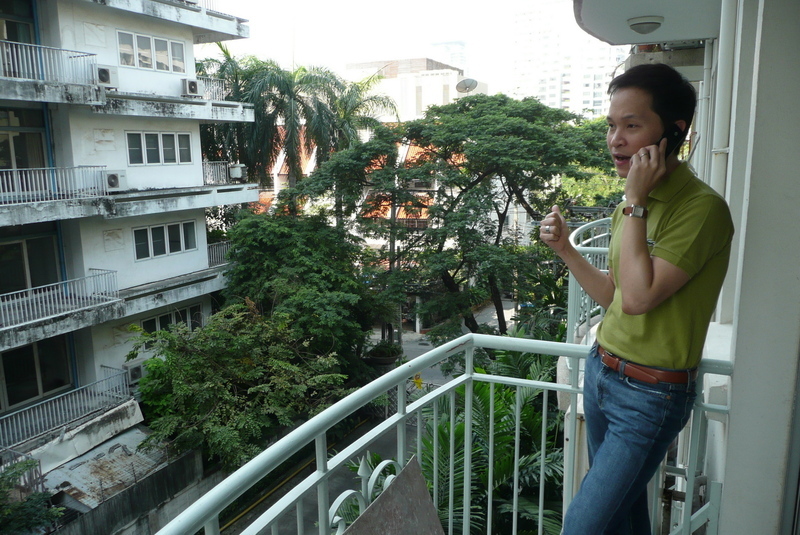 Below, Tawn on the phone with our contractor, expressing his concern. Thursday afternoon I will begin moving in boxes and getting the kitchen organized. Then Friday I’ll begin moving clothes and some other boxes. Saturday will be the big day with a pickup truck and a couple of strong young men to lift things. Most of the stuff is going to Tawn’s parents’ house, though. We will not move things into our place unless we specifically know where they are going. We still have two bookshelves being built and until those are installed, I want to minimize the number of boxes we have stacked up. Below: Tawn tries to catch his breath on the temporary sofa that we brought over from his room at his parents’ house. The slip cover isn’t meeting his needs and more work will be done. Eventually, though, the sofa will be replaced with a hide-a-bed sofa. So my apologies for any absence of meaningful posts over the next week or so. It will be busy here. One of the most fundamental aspects of the human experience, one that unites us with all the other mammals, is the search for safe drinking water. When I arrived in Khrungthep it was with the warning from some legitimate sources (as well as the conventional world-traveler-going-to-a-developing-country wisdom) not to drink the tap water. Actually, the water from Khrungthep’s Metropolitan Waterworks Authority is very clean and exceeds the standards set out by international agencies. 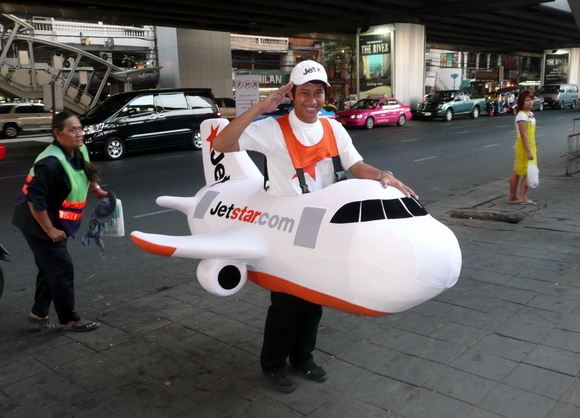 There is an English language page on their website that includes actual quality performance metrics – the most recently available ones are from August and September – as well as this interesting investigatory article from the Bangkok Post. Generally, it is agreed, any problem with water quality is due to the pipes in the delivery system, not the water quality from the treatment plant itself. When I first moved here we purchased our water in 5-litre plastic bottles from the supermarket and would carry them home, going through four or five bottles a week. This was a chore and, not realizing until afterwards that there actually is some plastic recycling going on here, I actually cut the bottles in half nesting the halves together, filling a suitcase with them for my trip back to the United States for the Christmas holidays, two months after I moved here. Needless to say, customs was a bit surprised but impressed with my dedication to recycling. Right: Out of water again using the home delivery system of water! After a few months of doing this, we finally found suppliers for home delivered water. There are two in the greater Khrungthep area, Sprinkle being the larger of the two. They pride themselves in their English and Japanese language service although I ultimately had Tawn set up the account because of miscommunication I was having with the operator. 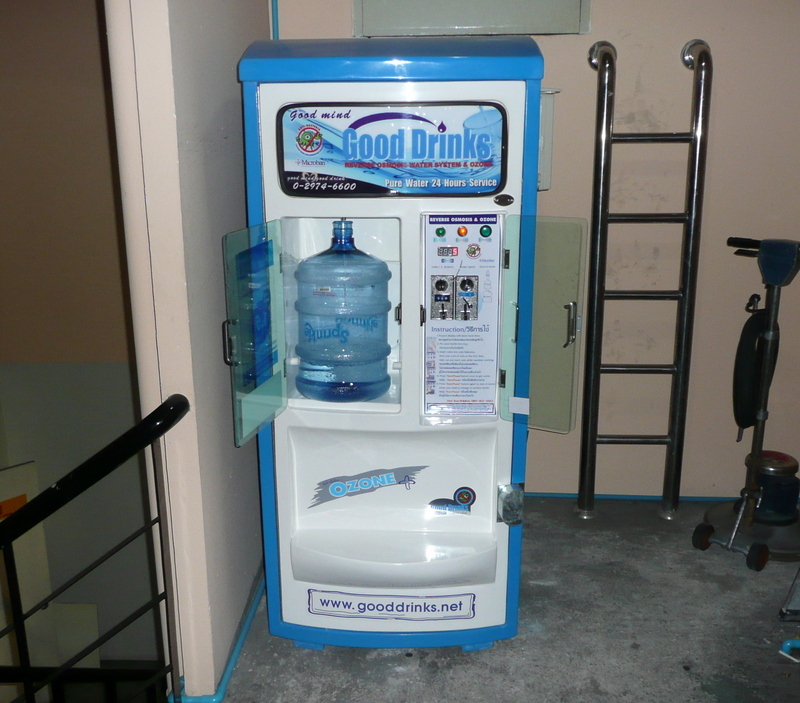 So for the past twenty months we’ve had three 19-litre sturdy plastic bottles in our storage room and when a bottle runs empty, we put it outside our door the following Saturday morning with a coupon (buy those in advance in books of 24, at about 95 baht a bottle – 5 baht a litre) underneath it. By late Saturday afternoon a new bottle had replaced it. A happy system that is pretty environmentally friendly and cost effective. Left: Carrying an empty container to the water vending machine downstairs. Those village women have nothing on me. 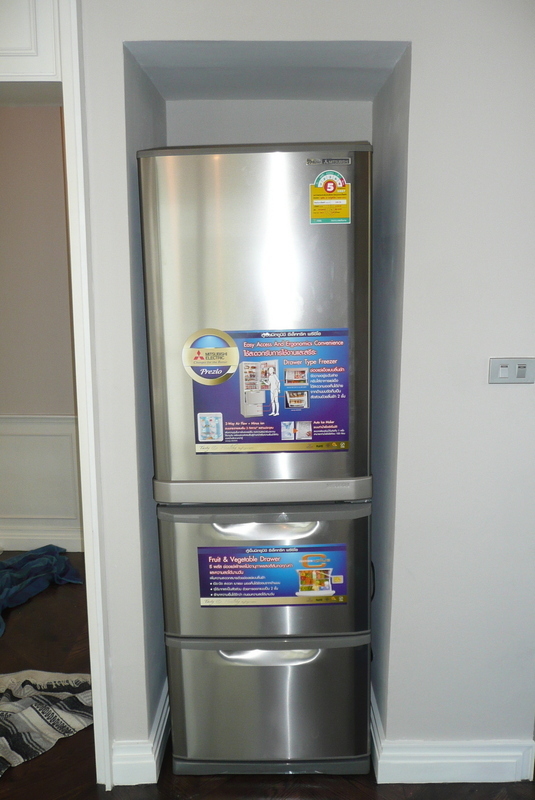 As we prepared for our move into the new condo, one of the things I wanted to explore was the possibility of installing a water filtration system so we could stop the delivery of water bottles. This was primarily because the new condo doesn’t have a storage room so space will be at a premium. Also, I have read more articles at places like ThaiVisa.com of long term expats who used filtration systems in their homes and found the water to be perfectly drinkable. Tawn’s parents have a large filtration system as do most locals, only the poorest of whom actually drink water straight from the tap without some additional treatment. 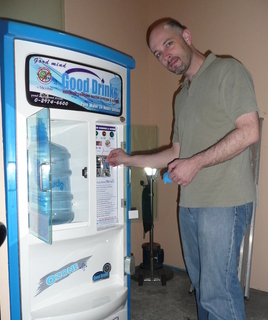 Right: The water vending machine near the juristic office. At the same time that we were exploring our options, around mid-October, we ran out of coupons for the home delivery system. Not wanting to buy another booklet of coupons and then have to deal with getting a refund for unused ones or transferring the service to the condo, we decided to try an alternative. 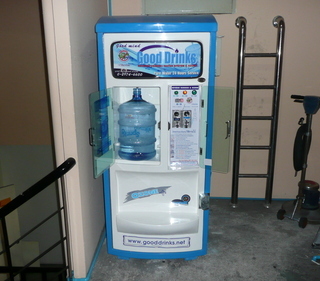 The juristic office here at Asoke Place had just allowed a company called Good Drinks to install a water filtration and vending machine in the stairwell outside the juristic office. There, for just 1.5 baht per litre, we could fill up our bottles with triple-filtered, reverse osmosis processed, and ozone-treated water whenever we wanted, day or night. So now, like a villager going to the well, we carry our empty 19-litre bottles from Sprinkle (which we’ll need to return to them soon to get our deposit back) down from the 25th floor to the 10th, refill them, and carry them back up to the apartment. Left: Using up our supply of coins to buy water. 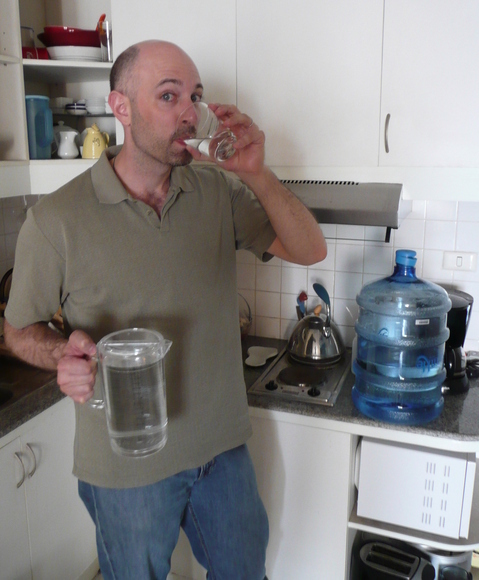 The water tastes a little flat – reverse osmosis removes a lot of the minerals that give water its flavor – but it is clean and cheap. 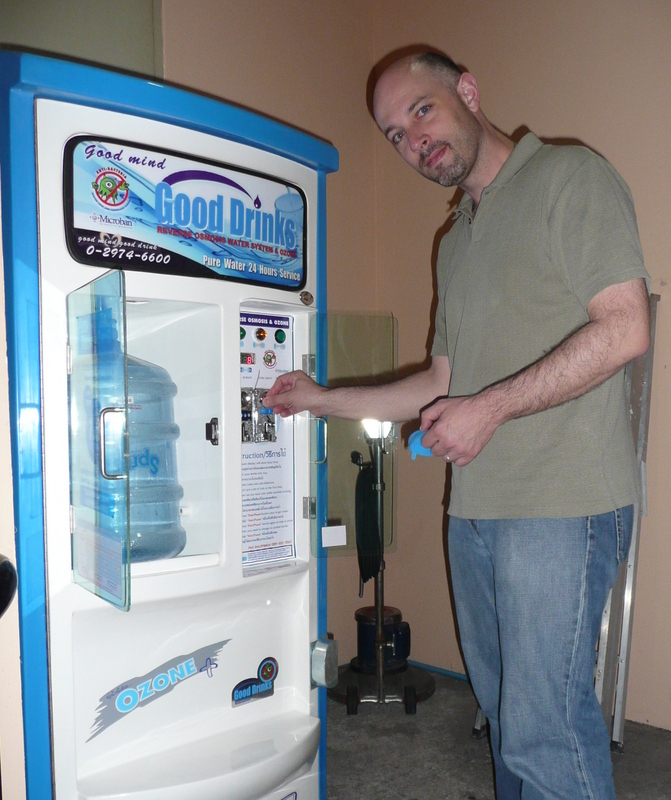 Plus the vending machine is a great way to use up our supply of one-baht coins. 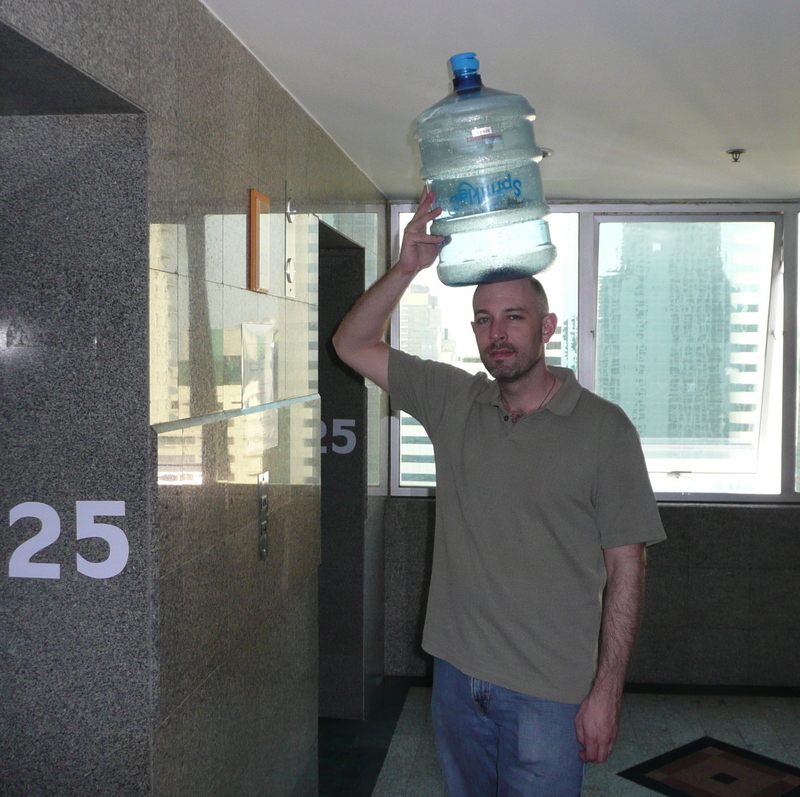 In another few days, the trek to the well should no longer be an issue as we’ll be in the condo. 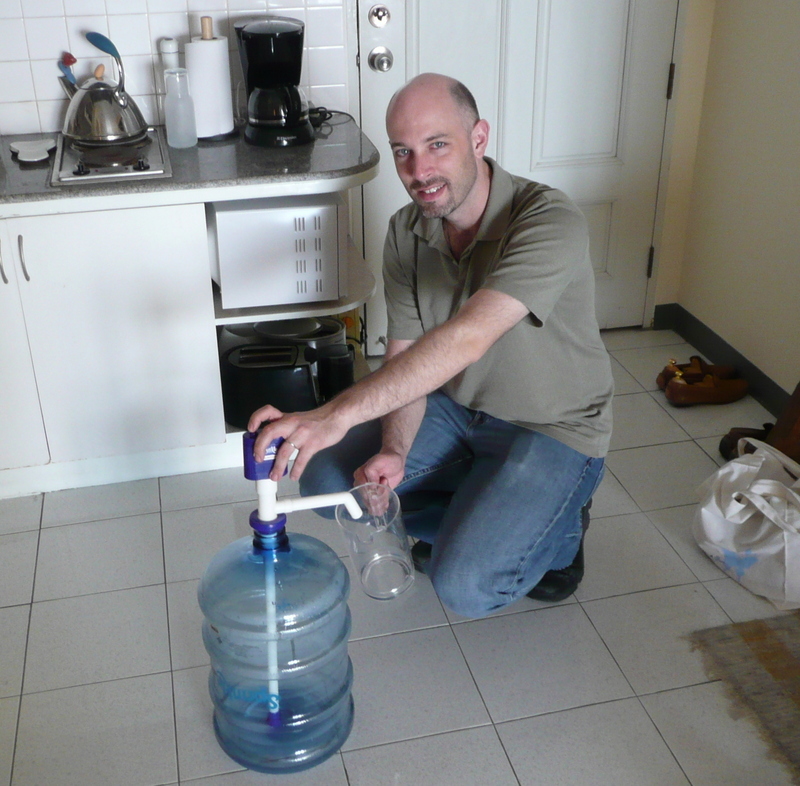 But the plumber tells us he is having problems installing the water filter, so maybe we’ll go full circle and be back to buying the 5-litre bottles from the store and carting them home until the installation is complete. Such is life by the watering hole. 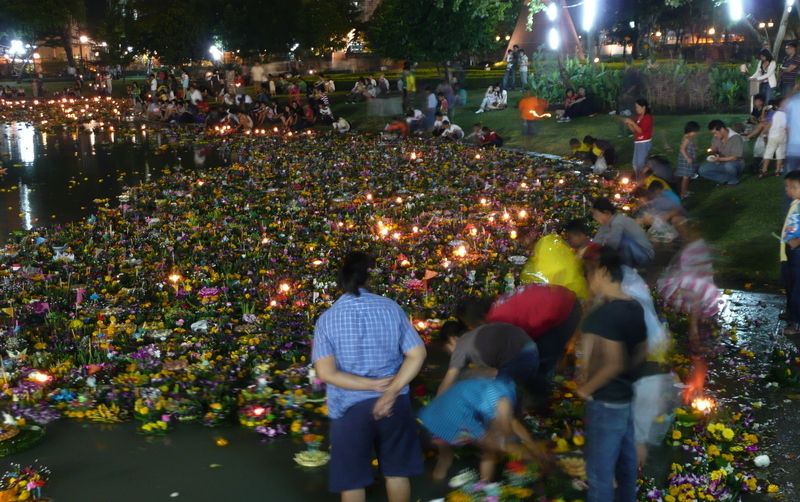 Above: Thousands of khrathong float in the lake at Benjasiri Park. 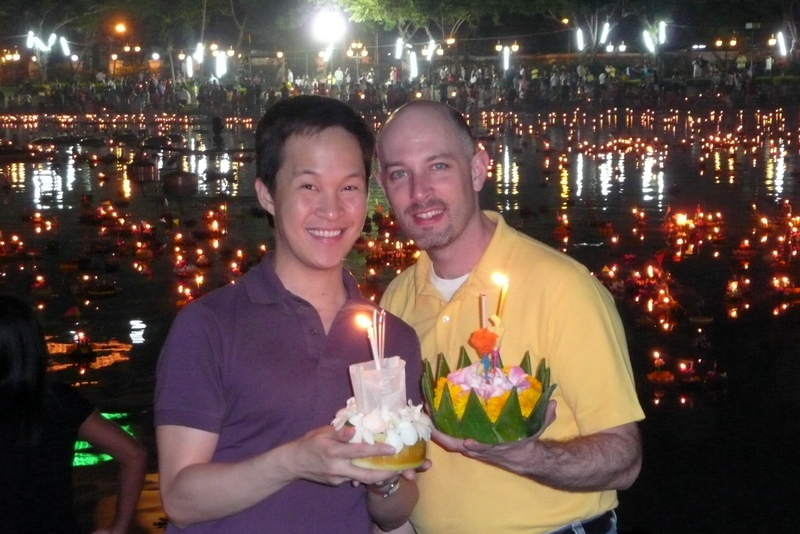 Saturday was Loi Khrathong, an annual festival in Thailand that ostensibly has its roots in the animist past, where all things have a soul or spirit and those spirits deserve our respect. 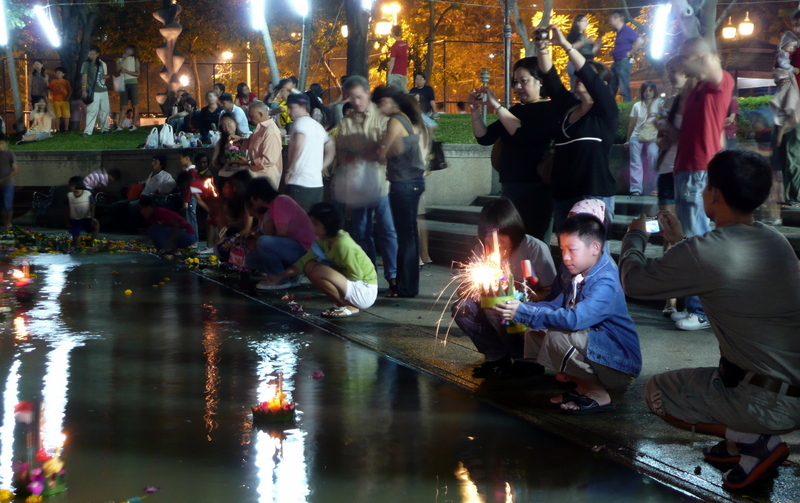 Water is central to Thai life and Thai mythology, and the “mother water” (the literal translation of the word mae nam – river) is venerated in the Loi Khrathong festival. You also see examples of animism in many old, large trees that will have colorful ribbons and strips of fabric tied around the trunk. Often there are small offerings left there, too. The spirit houses you see on almost every property are another example of this. Because the construction of the buildings has disturbed the spirit of the land, a house is built where the spirit can live. Food, drink, and incense is offered to the spirit every day. While its roots are in the animist past, for all practical purposes the modern-day celebration of Loi Khrathong has more in common with St. Valentine’s Day, for Loi Khrathong is especially a day for lovers and, the morality police report, the most popular day for young people to lose their virginity. As such, there is a public relations campaign in advance warning young people not to be in secluded or dark areas on Loi Khrathong, and threatening “love motel” owners who do not actively check the age and identification of all guests. Right: Full moon over the lake. The Emporium is in the background. After attending a performance of “A Christmas Carol”, presented by Bangkok Community Theatre and starring our friend Justin Brook as Bob Cratchit, we headed to dinner at a Chinese restaurant famed for its Peking-style roast duck. Located next to the Emporium, it was just a short walk to Benjasiri Park. This is the same park I walked by on Thanksgiving and saw the legless beggar crawling along on his belly, teaching me a lesson not unlike those taught to Scrooge by the three ghosts of Christmas past, present, and future. Below: Post performance with Justin “Bob Cratchit” Brook. From left to right: Tawn, Roka, Justin, Chris, Markus and Tam. Along the sidewalk a hundred vendors were selling khrathong, most made with somewhat environmentally friendly banana tree trunk, a few made from illegal styrofoam bases, and a good number made with bread bases – fish food! 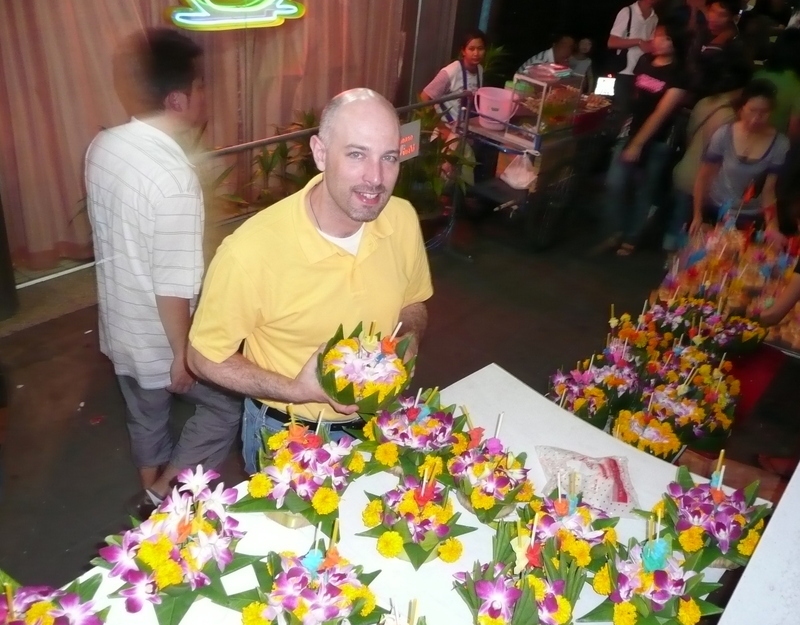 They sold nearly universally for 50 baht, a fair price if you consider the time put into making them. Below: Chris shops for khrathong. Below that: Bread based options. The park was lit up for the evening, fluorescent lights casting their eerie blue glow and the fire department’s search and rescue units having set up several light towers with bright-as-daylight tungsten lamps. Thousands of people were around the lake, many of them families, and while there were many people it wasn’t crowded. 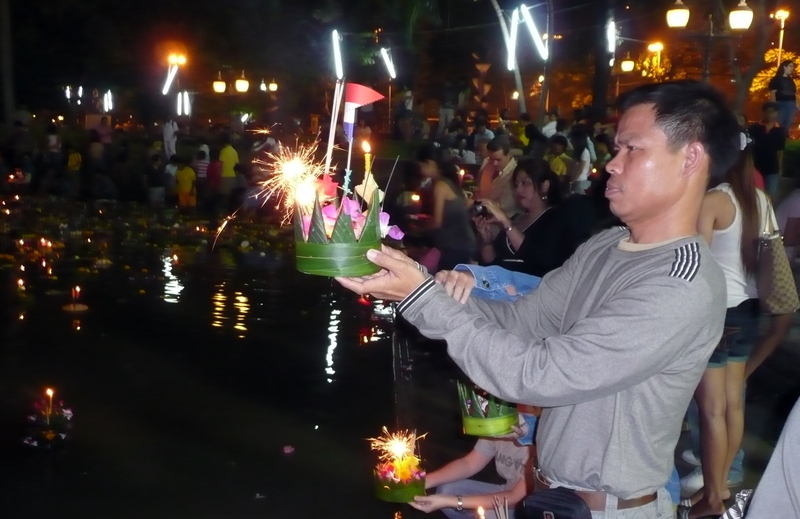 There was always room to go to the side of the lake to loi (float) your khrathong. Video shot by Pune of our launching. It goes vertical for a few moments when she forgot that she was shooting film, not photographs! 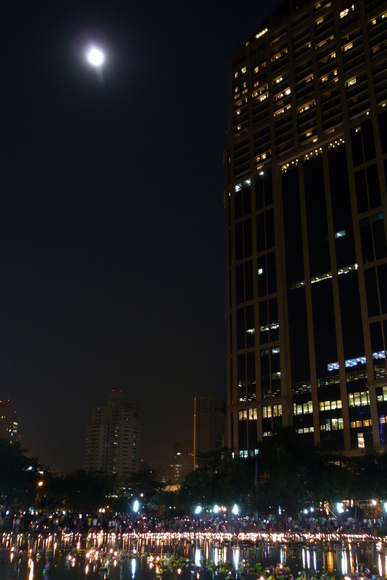 After launching our khrathog we walked around the lake to see the full moon. 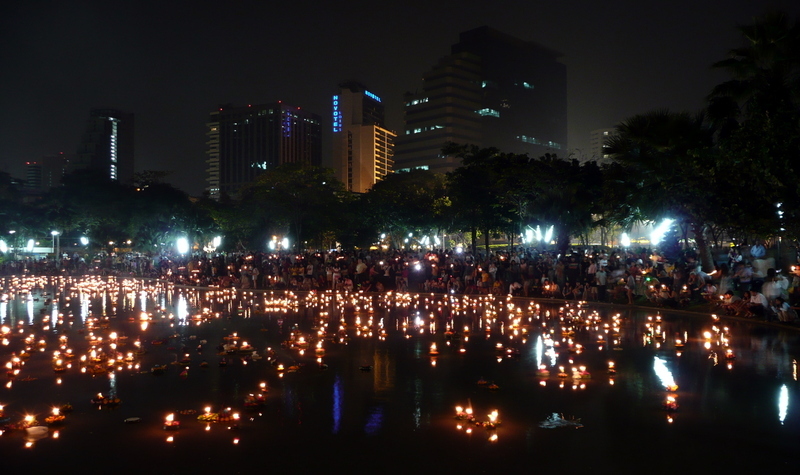 The festival is held on the night of the full moon in the twelfth lunar month, usually the second half of November. Two years ago it fell on my birthday, which was fun. It was difficult to get a really good shot of the lake and the moon, since the moon had climbed quite high into the night sky. Below: At the shallow end of the lake, people tear through khrathong searching for money. 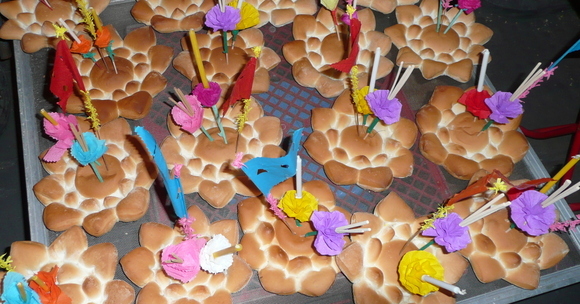 It is customary to place a coin on your khrathong (along with a hair) and so children and the less fortunate are known to go after the khrathong to search for money. When you are packing and organizing in advance of a move, all sorts of things are rediscovered that you haven’t seen in a long while. Most of the time, that’s a sign that the thing you’ve rediscovered is pretty unimportant and you could donate it to charity. Sometimes, though, the rediscovery is a good one and the thing is useful to find again. 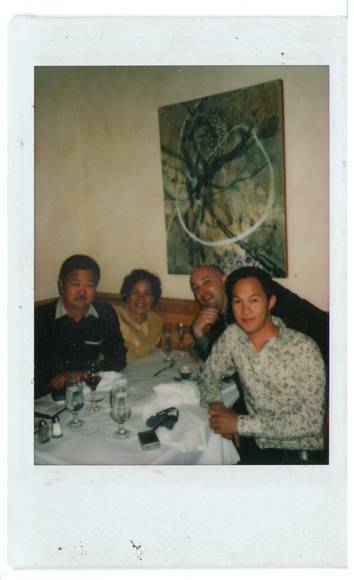 In a box near the TV and stereo I found this small Fujifilm Instax picture taken of Tawn and myself and Tawn’s parents. They were visiting him in 2002 and we went to Fringale restaurant in San Francisco. 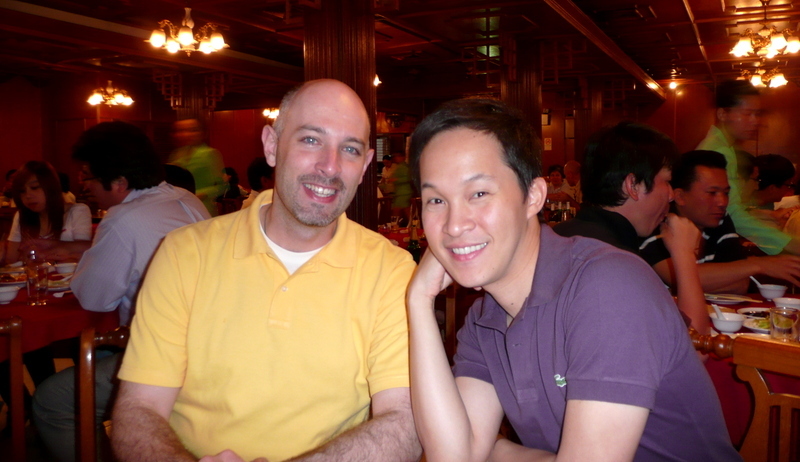 This was taken near the end of the meal, after we (primarily Khun Sudha and I) had consumed the better part of three bottles of wine. 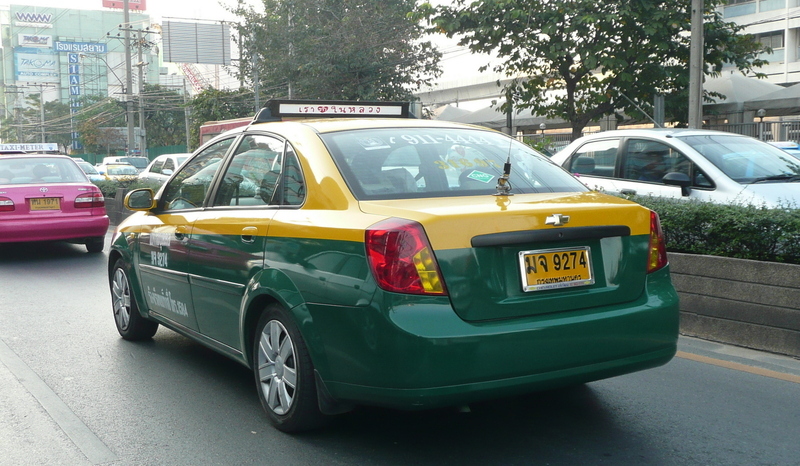 Khun Nui had had just a sip and Tawn, the driver, had maybe a glass. After Tawn dropped me off back at home – I was still living on Eureka and 21st I think – I could barely walk down the hall, having to use both hands on the wall to steady myself against the spinning. The next morning, Tawn’s father reported to him that he had “almost” been drunk the night before. That was when I realized I (or at least, my liver) would never be able to compete with my father-in-law. 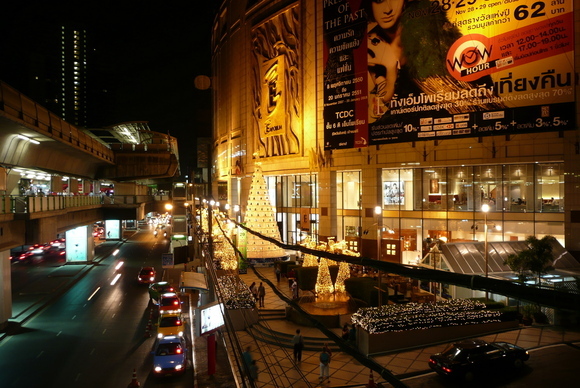 Above: Christmas decorations are up at the Emporium, next to Phrom Phong BTS station. 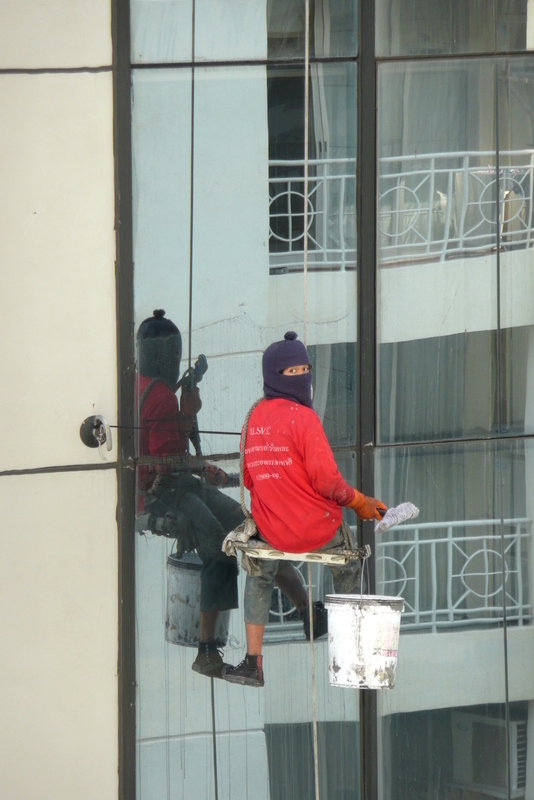 Below: Window washers hanging by a thread at the building next to our current apartment. You never know who may be watching you from his balcony! 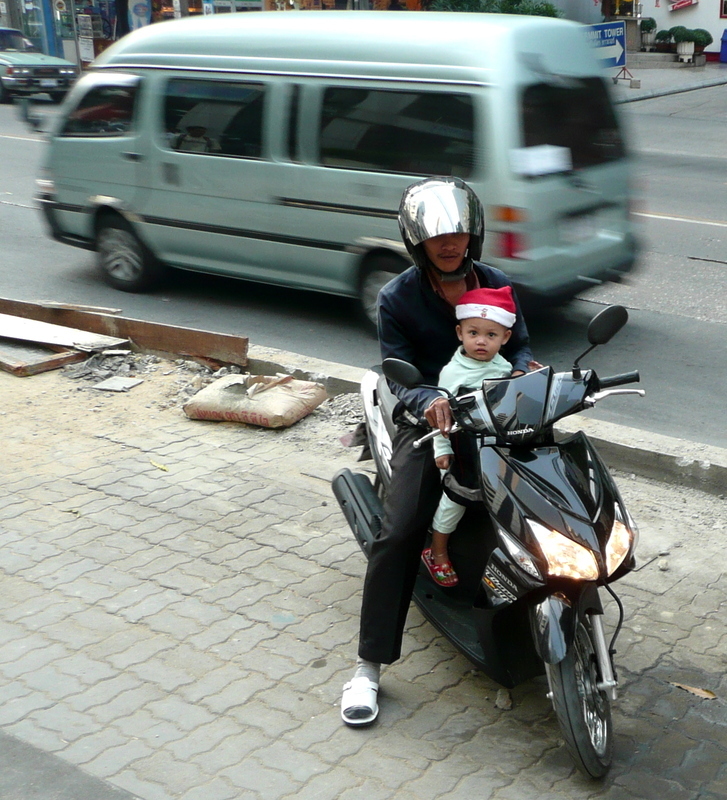 Above: Even the little ones are getting decked out with Christmas cheer. Below: Jetstar Airways celebrates its first year of Bangkok-Melbourne service with a giveaway of mobile phone charms and flyers announcing “2-for-1” promotional fares to Australia. Next to the Asoke Skytrain station, on the north side, sits an empty lot that was the Ford and Mazda dealership until some time last year. The dealership moved and the buildings were torn down and for the entire rainy season, most of the property became a swamp. In the southwest corner of the lot, where Sukhumvit Soi 19 connects with the main street, there is a row of four-story shop houses that contained among other things a nice Indian vegetarian restaurant. It looks like construction on whatever is going to be built there, is going to start soon. They shop houses are being demolished this week, an interesting process of literally deconstructing, or un-building, them. 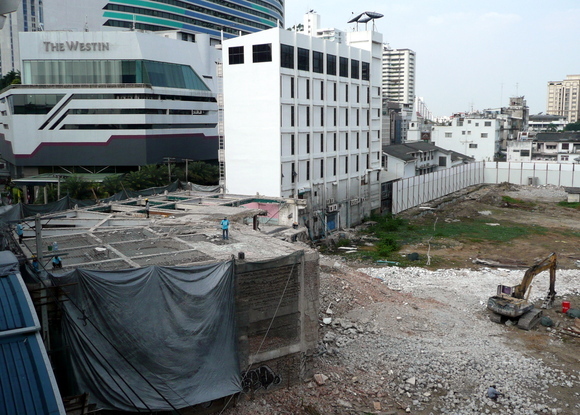 Below: From the platform of the Skytrain station, looking towards Sukhumvit Soi 19, you can see workers have already dismantled the top two stories of the building and are now working on the floor between the second and third story. 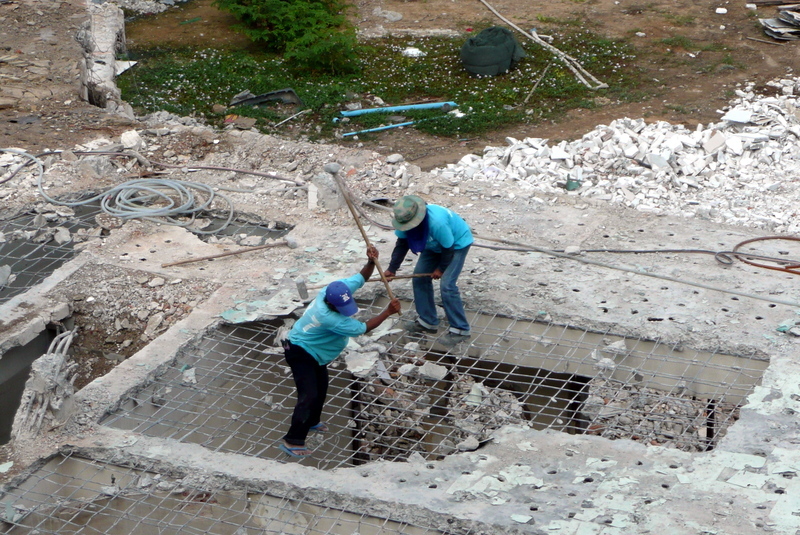 Above: Workers use sledgehammers (one worker has only flip-flops on to protect his feet) to break away the concrete, which falls through the re-bar to the floor below. Notice that they have to balance on the re-bar. 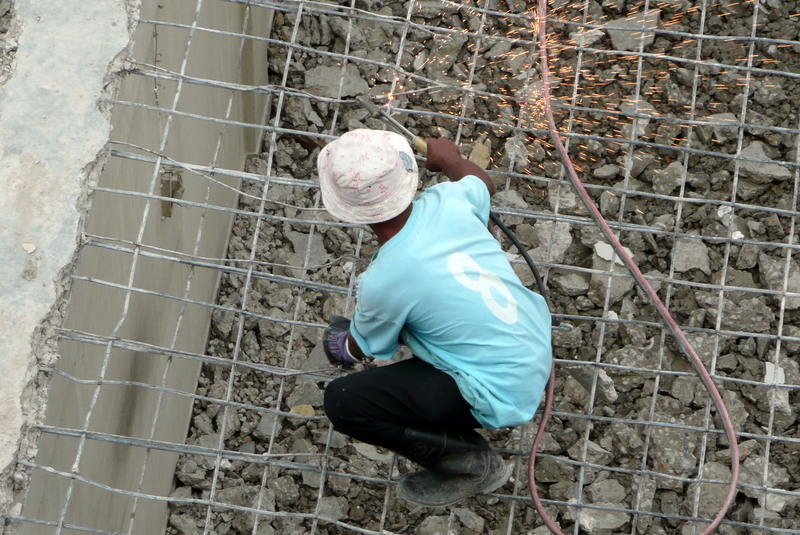 Below: Another worker then uses a welding torch to cut (or at least, weaken) the re-bar so it can be cut into smaller pieces that workers then manually carry out. I’m curious why he’s not at risk of the re-bar just giving way under him as he cuts. In the picture below you can see the concrete pieces that have fallen through. In other rooms, workers are clearing the concrete and re-bar and a small Caterpillar with a jack hammer is breaking away the interior walls between the load-bearing columns. Above: A few days later I passed by again and saw that they were now close enough to the ground that they could tear down the structure using this back hoe. I’m curious to see what will be built here. It is a very large property so a complex of several towers could easily be built. 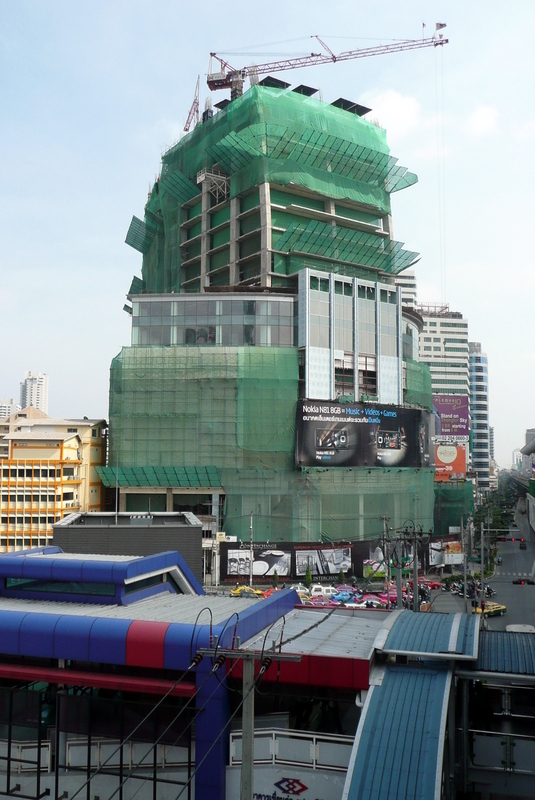 Good place for another mall, right next to the Skytrain station and the Metro subway at the corner of Asoke and Sukhumvit. Because that’s just what we need – another mall! As you can see, there is just lots of fun civil engineering stuff going on here in the City of Angels. 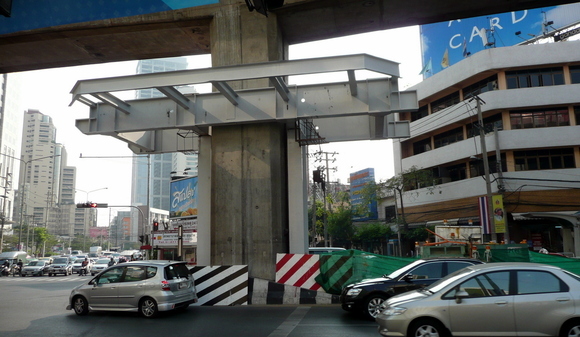 There is also a elevated walkway being built that will connect the Skytrain station directly to Interchange 21 and, I would assume, to the Exchange Tower that is on the southeast corner of Asoke and Sukhumvit. Above: In this photo taken from the Skytrain station ticketing platform looking generally east along Sukhumvit towards Asoke, Exchange Tower is visible in the upper center with some just-visible True Fitness purple signs over the ground floor windows. 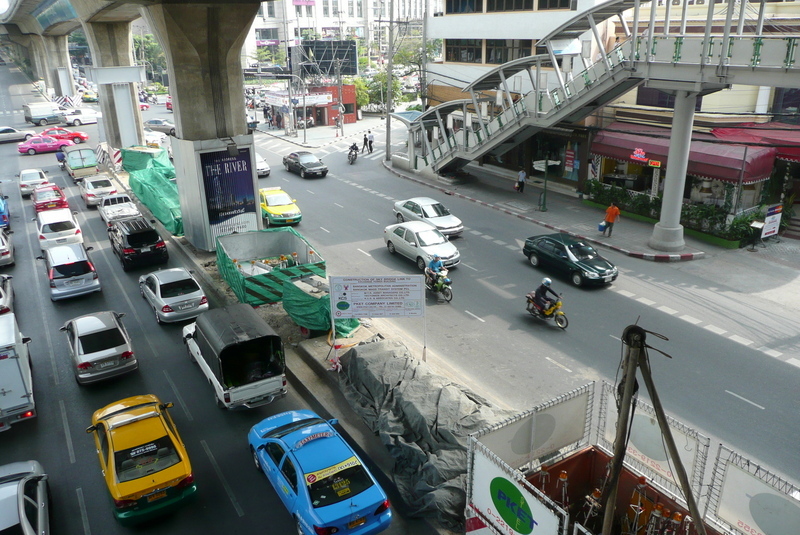 The elevated walkway will sit underneath the track viaduct and there will be a long span across the Asoke-Sukhumvit intersection. You can see work progressing on the foundations for the support columns. Below: Taken a few days after the above photo, the photo below shows the support for the walkway where it will go around the concrete column. Note that the support structure for the walkway does not connect to the concrete column so the walkway does not impose any additional load on the track viaduct. In this picture, you can see the Honda Jazz starting to turn right into the Asoke-Sukhumvit intersection. The steel structure that will span the intersection will connect to the structure you see in place here. Construction workers will hoist the steel span into place from 1-5 am on December 9th. I’m thinking about getting up early (or staying up late) to go down and watch that and take some pictures. 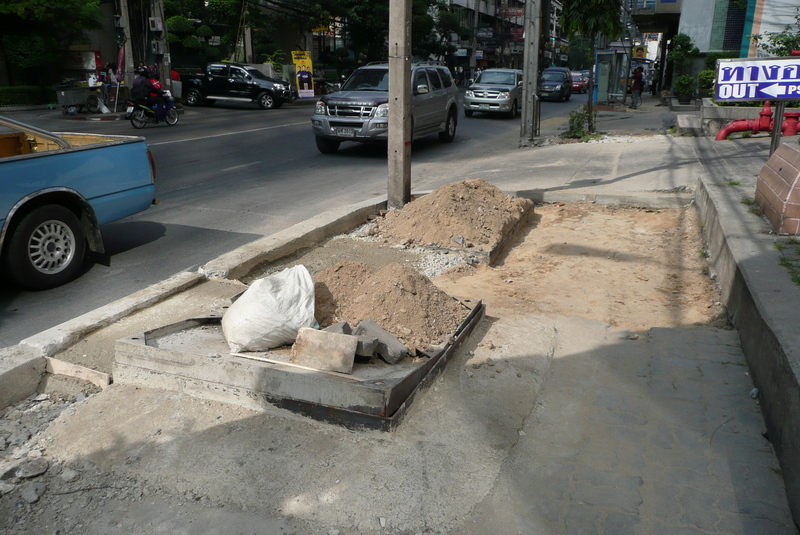 In the final bit of engineering updates for today, there is a project going on along Asoke Road, which is prone to flooding, to raise the sidewalks by several inches (and centimeters, too). 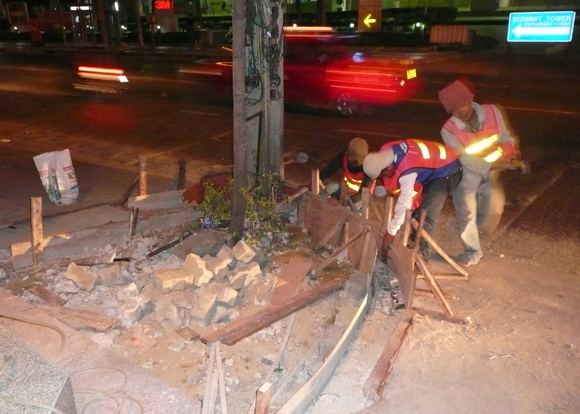 The construction process involves jack hammering the existing curbs (all done at night – here is a photo of the workers the night they were working just outside our building… all night long), building new curbs, removing the paving stones and raising up the ground level, then pouring a cement sheet and laying new paving stones. 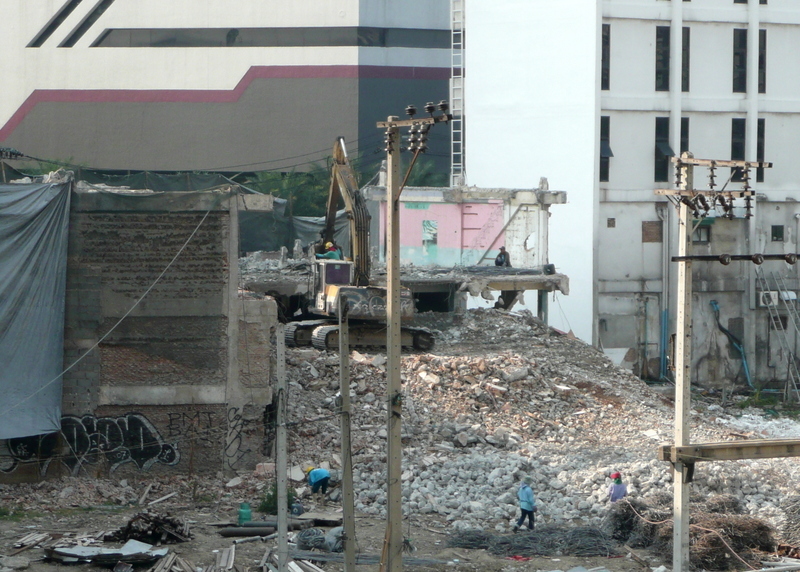 As of yesterday, much of the block we live on looks like the photo below. We have noticeably higher curbs but nothing has been filled in yet. Notice also that the covers to the sewers have been raised and new steel and concrete doors have been poured. The doors have a space for pavers to be added to them, too, so they match the rest of the sidewalk. Hopefully this project will be wrapped up soon as it is a pain to walk on the sidewalk and dangerous to walk in the street. And that’s this week’s civil engineering report. Back to you in the studio.